Emily Tempest has become the world’s most unlikely cop, an Aboriginal Community Police Officer no less. On her first day on the job in Bluebush in the Northern Territory she is one of the officers called to the scene of a stabbing out at Green Swamp Well. On the surface it looks like an open and shut case: two old drunks got into a fight and one stabbed the other in the neck. But to Emily, who knows both the victim (Doc) and the suspect (Wireless), something doesn’t feel right and she can’t let the investigation slide. Gunshot Road has it all. Literally. Everything I could possibly want from a work of fiction all in one gorgeous package. First there are fantastic characters. Emily Tempest is brave and stubborn and smart and funny and, as was the case with the first book in which she features, I’m still not entirely sure how a bloke can create such a credible female character but I’m delighted he has. In this book she is more mature than in her first outing though she still struggles when she knows what she should do is not what she wants to do and usually her heart wins out over her head. For better or worse. There are plenty of other beautifully depicted characters to look out for too. Like the teenage Aboriginal boy called Danny who is deeply troubled by something and unable to communicate his fears to Emily. And the town’s new top cop, taciturn and uncomprehending of all the things he doesn’t know, but trying to do the right thing in his way. And of course the setting, the harsh land in the country’s centre, is just as much a character as any person in the book. The desert isolation, the unrelenting heat, the laconic humour, the often awkward relationships between blacks and whites all combine to form an unmistakably Australian story. It’s not always a pretty one though and no one could accuse Hyland of trying to make it so because he tackles touch subjects such as the rampant domestic abuse of women in Aboriginal communities, endemic poverty and racism. However he somehow manages to do it without once lecturing from a self-proclaimed moral high ground. That’s a much rarer trait than it ought to be in modern literature. The town mob: fractured and deracinated they might have been, torn apart by idleness and violence, by Hollywood and booze. But moments like these, when people come together, when they try to recover the core, they gave you hope. It was the songs that did it: the women didn’t so much sing them as pick them up like radio receivers. You could imagine those great song cycles rolling across country, taking their shape from what they encountered: scraps of language, minerals and dreams, a hawk’s flight, a feather’s fall, the flash of a meteorite. The resonance of that music is everywhere, even here, on the outskirts of the whitefeller town, out among the rubbish dumps and truck yards. It sings along the wires, it rings off bitumen and steel. I could go on but I’d end up quoting the whole book. In short, Hyland’s writing is a thing of beauty and the entire book is, in part, one long ode to its country. Finally there is a great story and GUNSHOT ROAD is a more solid piece of crime fiction than its predecessor. For the first half of the novel there’s a fairly slow, humorous approach to the investigation as we’re introduced to all the players and people tease Emily about her new obsession. Then at a certain point the novel switches gears and speeds up as it becomes more serious and foreboding. Together these halves make up a perfectly paced story with a genuine nail-biting finish. Heck the book even incorporates, glorifies actually, geology, my favourite science. What more could I possibly ask for? Gunshot Road is a funny, beautiful, sad and thoughtful book that everyone should read. Immediately. When Tom McGillivray, superintendent of the Bluebush Police and an old friend of the Tempest clan, came up with some paid employment for Emily Tempest as an Aboriginal Community Police Officer, she was happy to accept. The deal was that she would spend a month in Bluebush in training and then she’d be based at Moonlight Downs as its ACPO. Emily’s just come back from a short training course in Darwin in time to catch the tail end of the Bluebush aboriginal community’s Young Man’s Time. On her way from the women’s camp to work she stops and washes off her body art under a garden hose, and dons her oversize police uniform. That in itself seems symbolic, as she attempts to bridge two cultures. She arrives at work to find that there’s been a murder: One oldie has killed another out at Green Swamp Well, and McGillivray is in hospital, his place taken by a new senior sergeant Bruce Cockburn. On their way to the crime scene Emily senses something out of place and discovers a Range Rover that’s gone off the road, its occupants spilled into the gully and in need of help. When they eventually make it to Green Swamp Well, Emily finds that she knows both the victim, and the apparent perpetrator, two eccentrics who had a history of argumentation, but were underneath it all the best of mates. Emily was never going to get on with Senior Sergeant Cockburn: where he tries to simplify things, she sees complications. Emily’s aboriginal background gives her a heightened sense of disturbed balance. He reminds her that she is simply meant to be a liaison officer not an investigator, but Emily really can’t help herself. There is such a lot to like about this book: starting with Emily herself and her unexpected sense of humour, and then there is such a range of interesting and intriguing characters, and description that takes you right into the heart of the outback. I like the way Hyland layers our introduction to people and events. One or two characters from his earlier novel DIAMOND DOVE make an appearance. Emily herself seems more certain of who she is, and she has a status with the locals that I didn’t pick up in the earlier novel. Takes a little time for the country to get to know you. 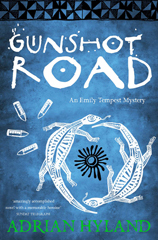 I have no hesitation in recommending that you find a copy of GUNSHOT ROAD. Debut author Adrian Hyland topped the oz_mystery_readers 2007 best reads list with DIAMOND DOVE with 5 people recommending it. The group discussed it in September when Adrian was the group’s guest on Quiz an Author, an event when an author is invited to be an online guest for a week, and questions and answers fly thick and fast. Fresh from being named the Ned Kelly best first fiction novel of the year winner at Melbourne Writers Festival, Adrian was frank and eloquent in his replies and has remained an active member of the list. DIAMOND DOVE was given a rating of 5 by the members, a rare achievement in itself. The only other book to be given a rating of 5 was RAVEN BLACK by Ann Cleeves. DIAMOND DOVE has been published in the US as MOONLIGHT DOWNS. Emily Tempest returns to Moonlight Downs, a scatter of corrugated iron hovels nine hours from Alice Springs out in the spinifex desert, 14 years after leaving to go to secondary school in Adelaide. The daughter of a local miner, Motor Jack, she is welcomed home by Lincoln Flinders, the head of the community. The Moonlight mob have only recently returned to their land themselves. The Moonlight mob are Emily’s community by adoption – her mother was a Wantiya woman from the Gulf Country. Unmistakably aboriginal in appearance, Emily has not yet decided which world she belongs to – aboriginal or white. She meets up with Lincoln’s daughter Hazel, her best friend in the past. The morning after Emily arrives, Lincoln is found dead, unmistakably murdered, and Emily finds it impossible to rest until she knows who killed him. Adrian Hyland’s debut novel. Very polished writing and a feel of authenticity about the setting and customs. I came away feeling I had learnt quite a lot.